LOL..♥. . Wallpaper and background images in the Damon & Elena club tagged: the vampire diaries delena elena damon salvatore elena gilbert. ahah, so people are having fun on facebook? Lol! '13 people like this'. Poor Stefan, keeps getting shot down. 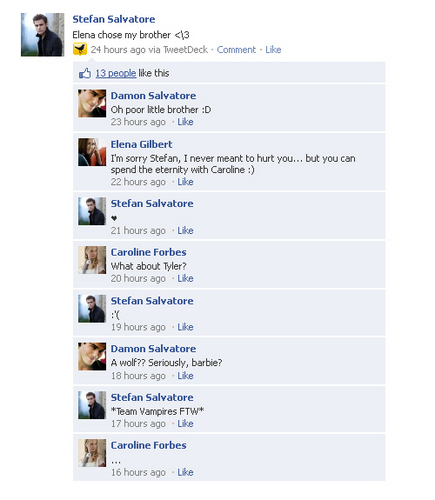 And Caroline getting dissed, ha ha. I love these Vampire Diaries Facebook chat pics. LOL. OF COURSE SHE CHOSE YOUR BRO STEPHAN, WHO WOULDN'T!!!!!!!! AND I SOOOOO AGREE WITH DAMON, VAMPIRES FOREVER!!!! !